As a brand new school, Kensington Park School underwent its first ever inspection in October 2018. The inspection report contains many extremely positive comments about Kensington Park School, and we have been judged to be Good or Outstanding in all areas. Inspectors were particularly impressed by the positive relationships between teachers and pupils and the impact this has on teaching and learning. The curriculum was viewed as strong, while the school’s work to promote pupils’ personal development and welfare was judged to be outstanding. The sixth-form provision was also deemed to be outstanding. 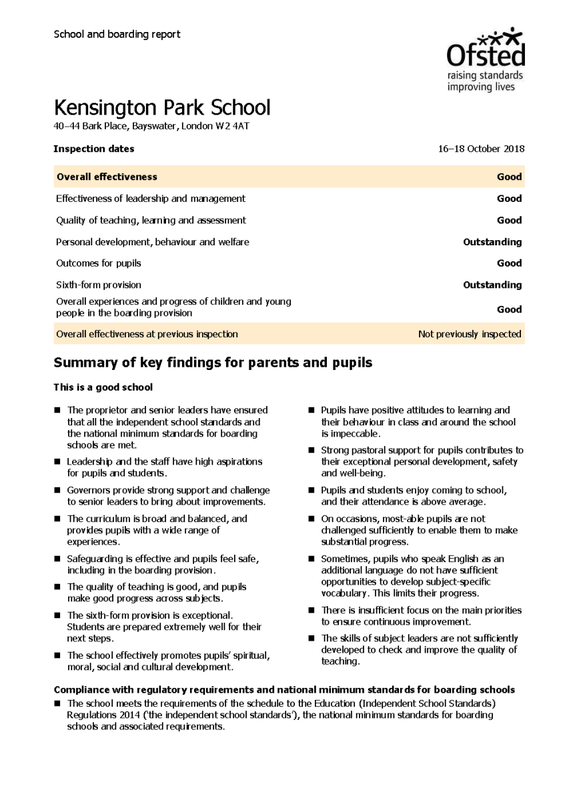 There is a liberal smattering of words such as “excellent” and “exceptional” throughout the report, and while naturally there are aspects for the school to work on, it is not unreasonable to say that the judgements arrived at by the inspectors are themselves nothing short of exceptional for a school that had only been open for seven weeks at the time of the inspection. Strong pastoral support for pupils contributes to their exceptional personal development, safety and well-being. The curriculum is strong and broad and successfully balances academic subjects with technological, physical and creative education. The sixth-form provision is exceptional. Students are prepared extremely well for their next steps. The quality of teaching is outstanding. Teachers have excellent subject knowledge and very high expectations of students. The tutor system is exceptional. Students show exceptional attitudes to learning, and their behaviour is excellent. The boarding provision provides excellent facilities and support to ensure that boarders keep on top of their studies. Pupils and students enjoy coming to school.